Sixty years after his late father Billy Graham preached the Gospel across Australia, Franklin Graham has returned to preach the love of Christ in the same cities. 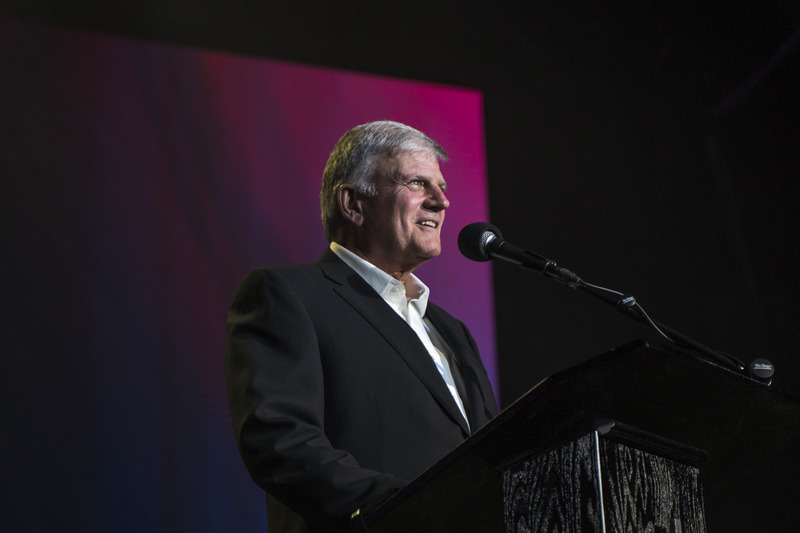 Just hours away from the start of his tour across Australia, Franklin Graham had his sight set on one thing: preaching God’s Word without compromise. Sixty years ago this month, his father stayed true to that same mission as he held Crusades covering Australia and New Zealand. Billy Graham had no idea that simple Gospel message would touch millions. Now, with a six-city Graham Tour across Australia, Franklin Graham is determined to show the power of God’s Word to change lives in the Land Down Under, yet again. 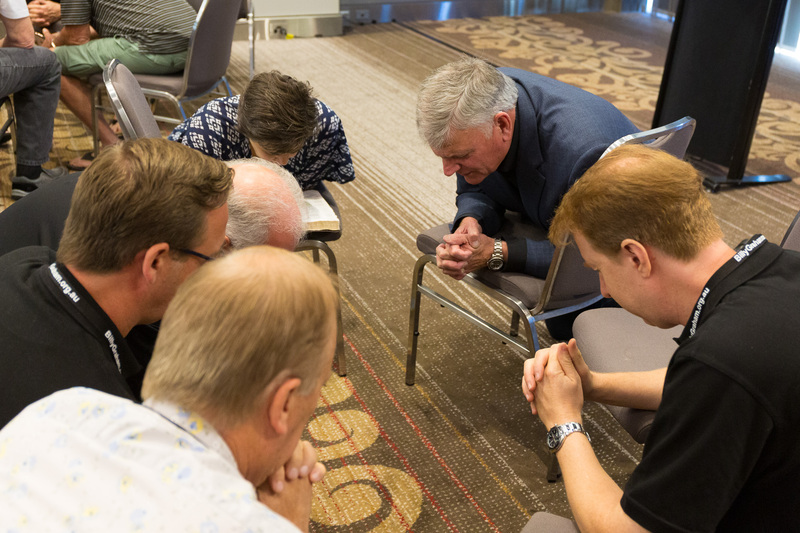 “I didn’t want us to assemble together without prayer,” Franklin Graham told the Graham Tour team after calling an impromptu devotional time on the morning of the Perth event. A lot has changed in Australia since 1959, though. More and more people are turning away from the church and viewing religion as a less relevant part of day-to-day living. That’s led some Christians to compromise. “[The enemy] wants pastors and churches to believe preaching the Gospel and giving an invitation are old fashioned,” Franklin Graham told the Graham Tour team Saturday morning. “But God still uses preaching. Saturday night in Perth, Western Australia, that was evident. Perth marked the first stop of the Graham Tour spanning 16 days across Australia. Planetshakers and Crowder are tagging along to perform during most of the tour. Although Saturday’s kickoff event wasn’t youth-focused, hundreds of young people poured to the front of the stage to join both groups in worship. Jo, a prayer volunteer from Perth, was inspired after praying with three teenage girls, all the same age as her daughter. Coming into the event, she admitted she had her doubts. How would it be perceived? Would churches really unite? Could the message make a difference? 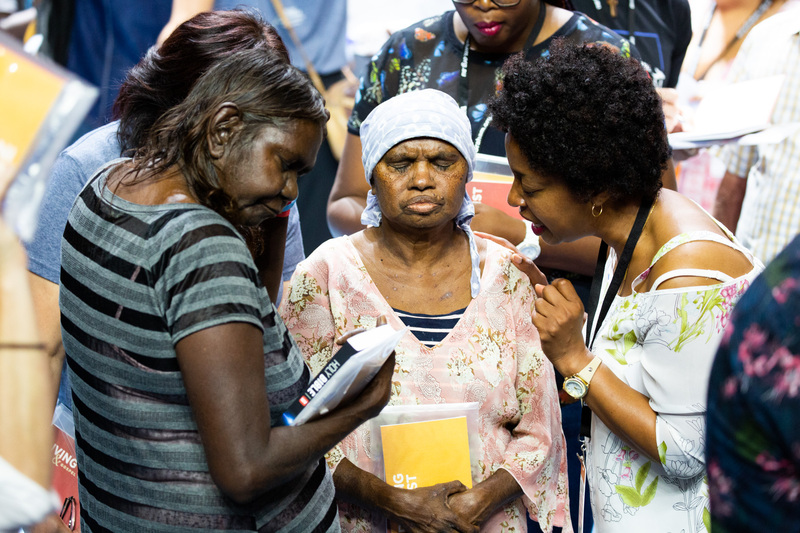 A Graham Tour volunteer prays with two Aboriginal women who walked forward to make a decision for Christ. Jo’s questions were quickly put to rest. “I looked around and wept the whole time,” she said. Prayer volunteers David, Edgar and Luna had a similar reaction as God exceeded their expectations. David and Edgar are brothers. Edgar and Luna are engaged. And together they decided to serve during the tour after hearing about the event through their church. “[God showed what] He can do from the younger generation to the older generation,” Luna added. The crowd was truly a sight to see, with people spanning the width of the RAC Arena floor. On one end, a group from Australia’s often-forgotten Aboriginal community prayed together. Nearby, an elderly woman prayed for a woman in a back brace as if her life depended on it. Zipping by them—a man wearing a shirt with the words “Leave None Behind.” He walked hand in hand with a little boy to introduce him to a volunteer trained to share Jesus in a way he’d understand. “You can leave this arena forgiven,” Franklin Graham told the crowd—and hundreds left knowing that reality. Thinking back to those three friends who tearfully made decisions for Christ, Jo realized the impact this event could have. “They now have the rest of their lives to live for Him,” she said.